Posted on October 12, 2018 by Elizabeth E.
I used the Starry Sky block pattern, by Kylie Kelsheimer (a downloadable pattern from Craftsy). In this new version of her pattern, she has three sizes, and the 6″ size is perfect for a mug rug. My niece likes to go hiking, and lives up in the Northwest, so I used colors of purple mountains, green hills and aqua-and-blue waters. I bound it in navy. I used an agate-stone looking print for the back, one of my favorites lurking in my stash. It took me a couple of hours from start to finish. It’s a paper-pieced pattern, so all the star points are sharp and it goes together easily. I kept a photo of the block near me when putting the pieces together, to keep myself straight. I listened to the latest Bruno, Chief of Police book, The Resistance Man, and that kept me going. Then I ran it to the Post Office, and off it went. I hope Abby likes it. A couple of days before I’d made Simone’s blocks for the Gridsters Bee, a wee bit late, but she forgave me. And then I got right on October’s blocks for Joan, for the Gridsters Bee. She asked for a black-and-white New York Beauty block, with a touch of solid color. Hope she likes these. I liked this old photograph of women sewing, found on the website for the National Gallery of Ireland, reminding me of my travels (I’m finally over the jetlag). Posted on July 11, 2018 by Elizabeth E.
“What is distraction, if not self-sabotage, sabotage of one’s future self?” Pressman, who wrote the War of Art, a must-read for creatives, writes about about the difference between being an artist and being an addict, about the difference between being a professional (focused on the work) and an amateur (talking about the work, but not really doing it). It’s easy to forget why we work at something. There we are, putting our focus on our machines and in our sewing spaces, cutting and sewing, and all of a sudden, it’s oh wait a minute, let me check what my friends on Instagram are doing. According to Pressman, that doesn’t get the work done. What it does do instead, is turn our work, our lives, our posts into an endless loop of sort of getting things done, but not really forging ahead into new places. As Jocelyn K. Glei put it, “I was particularly struck by his distinction between “the artist” and “the addict,” wherein the former is living out a productive, creative career, while the latter is caught in an endless loop of aspiration and yearning that never gets backed up with meaningful action. Glei also noted that: “The amateur is an egotist. He takes the material of his personal pain and uses it to draw attention to himself. He creates a “life,” a “character,” a “personality.” Using the term “shadow novel,” he draws out the life of a person is sort of working towards something, but not really. Like I was after grad school: wanting to be an author, but not writing a word. I soon figured out that being a fiction writer was not the direction I was doing to go. I was able, however, to take my MFA training and love of the written word, combine it with sewing, in order to write about quilting — a completely unplanned, but incredibly satisfying endeavor. Cindy and I have talked more than once about the world of social media (namely Instagram) and how it sometimes interferes with getting the work done. I love a good stroll through the posts as much as anyone, and I love to read blogs and see what creative juice is running through my community. I recently watched the entire launch video of IGTV, that futzy little button in the top right of your screen. As they went through all the scenes of creators (our new name, I guess), I realized that they were all barely older than my grandchildren…and with that realization came the understanding that IG “allowed” me to have my community, but what they were really about was the selling of “new media,” geared to “young influencers” gaining followers, gaining media attention and earning money. Hence, the screwed up IG feed for the rest of us. Chronology is out. Connectiveness is in (which is different from “connections”). Process is out. Profits are in, including the data mining of all our click and taps and touches. What does this have to do with artist/professional vs. addict/amateur? As Pressman states, “The artist and the professional, on the other hand, have turned a corner in their minds. They have grown so bored with themselves…What were once their shadow symphonies become real symphonies. The color and drama that were once outside now move inside….When we [choose being an Artist], the energy that once went into the Shadow Novel goes into the real novel. What we once thought was real – “the world,” including its epicenter, ourselves – turns out to be only a shadow. And what had seemed to be only a dream, now, the reality of our lives. It’s all about where you focus, where you put your attention. Make use of the tools that help you, but don’t let them dominate allotted time, or dilute creative energy. 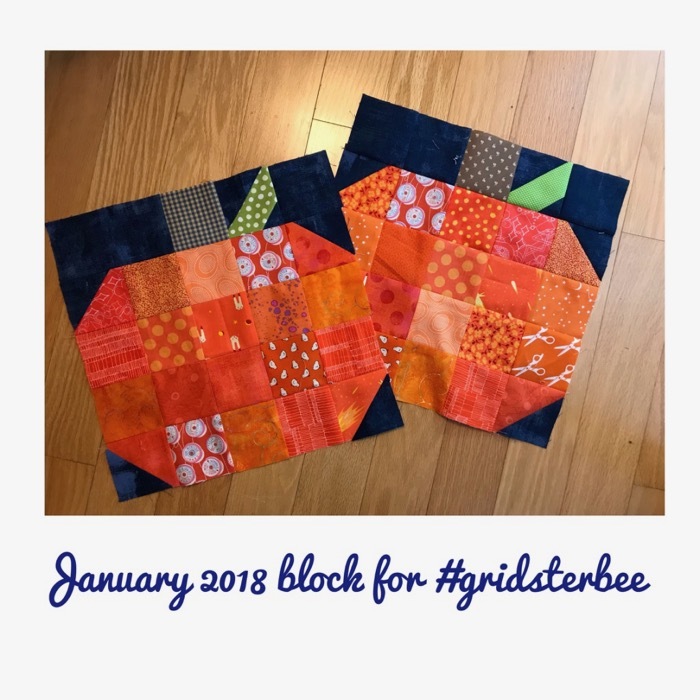 Posted on January 29, 2018 by Elizabeth E.
I belong to an online bee called the Gridsters, and February is my month to choose a block that my beemates make for me. You can find all our work on Instagram, using the hashtag #gridsterbee. I chose a basket block. I also have been saving food-themed fabrics forever for a basket block quilt with the baskets full of food beginning at least a couple of decades ago, and continuing as I picked up a food fabric here and there. I’ve sent you some food fabrics; please use those for the A section of your blocks. I don’t care what you use for the basket–it can match, it can contrast, it can coordinate, it can clash–choose what you think creates the look you want. You can use small scale prints, large prints, florals, novelties, checks, whatever. They are a range of creamy-toned fabrics, without strong secondary designs. Solid in creams is okay, but avoid white, grey, tan, beige, white-on-white (I really don’t like beige for this quilt, but understand the limitations of our stashes–just do your best). Many of the above fabrics have strong motifs and patterns, so reject those too. Basically, I want the background to recede without being dull or same-same. Not to size, for reference only–please use the PDF link below. All my basket pieces laid out. First, make the Half Square Triangles. Place one 6″ background square and one 6″ basket square right sides together. Mark two diagonal lines, and sew 1/4″ on either side of the marked lines. On the left is the pieces with the sewn diagonals. Press it flat to settle down the wrinkles, which you see on the right. I moved mine apart to demo this; leave yours close together. Cut on marked lines. Now without moving your squares, cut on mid-lines, crossing the centers, as shown below. Press, with seam allowance to the dark side, trimming out dark fabric, if necessary, so it doesn’t show through. Trim to 2-1/2″ inches square. Press seam allowance ALWAYS towards basket, to give that dimensional look that something is IN the basket. Now trim that center to 6-1/2″. Here are all the pieces, laid out. I chose a stripe to demo, so you can see the direction the stripes go. If you use the eight-at-a-time half-square triangle method, you’ll have no problem getting the stripes in the small half-square triangles go the direction you want. Yes, I did cut the 6-7/8″ square (basket) on the bias, so I could have the stripes go across the unit. I made two blocks at once; one had a light center, and one had a dark center. Stitch together the three small half-square triangle pieces; press in the direction they want to go, which is usually toward the flat triangle piece. Stitch one 2-1/2″ block onto one unit (shown in upper left corner). It helps to arrange your square as you go, so you get everything all sorted out right. Sew the first three-unit “basket handle” to the center HST, as shown on the left. Press seams away from basket, even though they don’t want to go there, again to preserve the illusion that something is in your basket. Sew the second three-unit “handle” with the C square to the center unit, as shown. I pressed the square C-block toward the three-triangle unit so that the seams would nest neatly when I arrived at this step. Create basket stand by sewing one of your small HST to the D-rectangle. Pay attention to which direction the triangles are going. Stitch this first unit onto the basket. Repeat with second HST and D-rectangle. Sew ONE of the C (2-1/2″ squares) to ONE of the basket stand units. Stitch this onto the existing basket. I like this setting, with all those energetic chevrons in between the baskets. Thanks to the Gridsters for making me baskets this month, and I hope you all have fun making a few for yourselves. 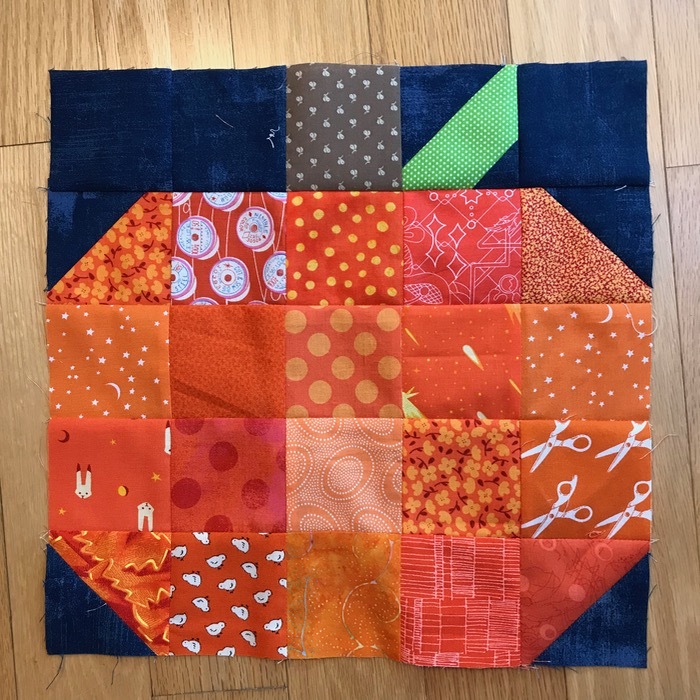 Posted on January 19, 2018 by Elizabeth E.
Carol kicked off the Gridsters this year, doing a little throwback to fall, for she said she wanted to make herself a quilt for autumn. She asked us to use this tutorial from The Cloth Parcel. I had fun finding orange fabrics that would work, and picked up some bold orange Grunge dots to work into the pumpkins. She had mailed us the navy Grunge for the background, and after I finished my first pumpkin, I found I had enough for another, so I sent two. These come together quick and easy, so if you are thinking ahead…or behind…it would be a fun quilt for fall. 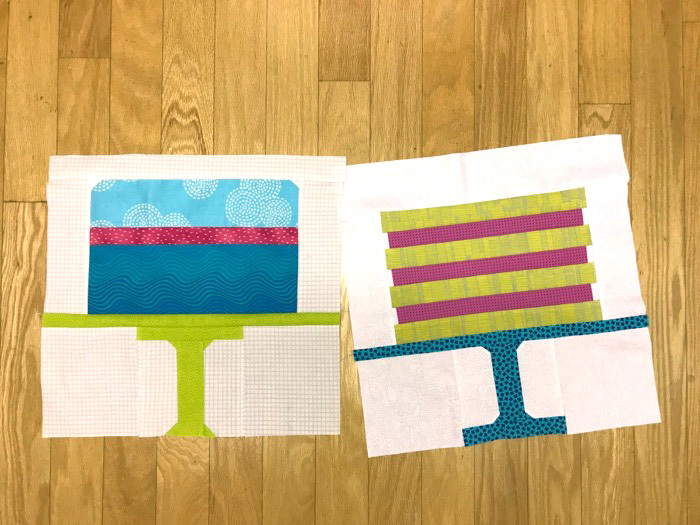 Posted on December 18, 2017 by Elizabeth E.
Four of us got together to do the last block of 2017 for Afton, of Quilting Mod. 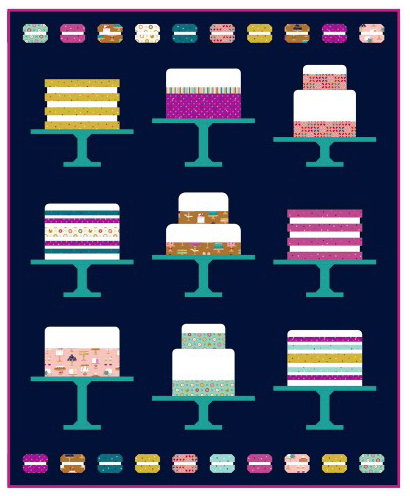 She’d asked that we do a cake from Patty Sloniger’s pattern (for Michael Miller Fabrics), and Afton mapped out our plan of which stand for which cake. I had a different cake from Lisa, Leisa and Simone, but our stands were all the same. Luckily. The quilter who made the cake on the left was the first to finish, but whoops…she had to redo the cake stand. 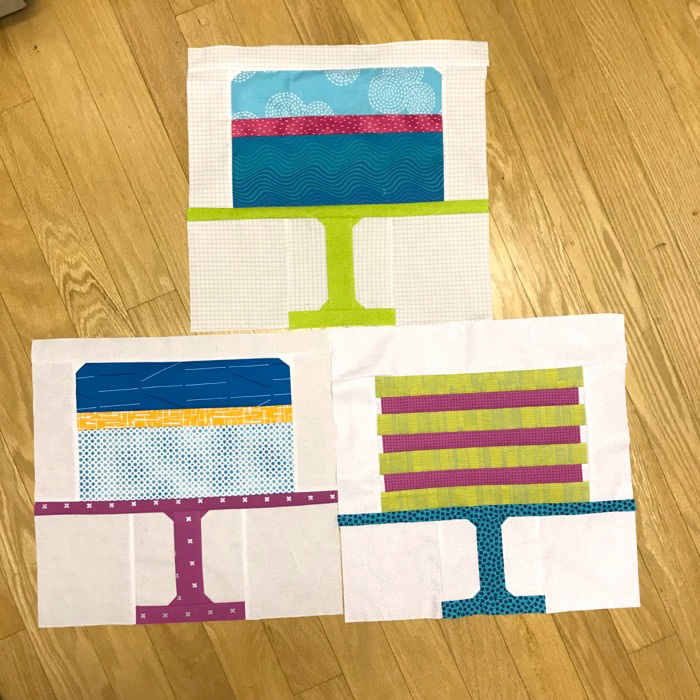 One of us had to leave early to pick up kids, so I don’t have that quilter’s block, but here are three of the cake blocks finished. In all the fun, I never took a photo of my block by itself, but I’m the stacked layer cake on the lower right. The pattern went together without too much drama, and we shipped them off to Afton. That’s the end of the Gridster Bee for 2017, but we’re gearing up and are all ready to go for 2018. This is the last sew day for all of us together, as Lisa (in blue sweater) has moved away to another state. She and I started our little quilt group of twenty years, and it is odd not to see her around, or to be able to pop up and borrow some fabric (she lived close to me). I wish her all the best in her new home, and hope she finds lots of quilters to hang out with! Posted on July 24, 2017 by Elizabeth E.
I also dragged out my hexagon quilt, and got started again. Here is Rosette #7, isolated (above), and below as it looks sewn into the quilt. I took the blocks and quilt rosettes with me on our recent family trip — since we had a lot of driving time — and was able to get the rosettes sewn together and one more completed. I’ve totally revamped Rosette #8, because frankly, everyone on the Facebook page was having real troubles with it, so I thought I would have a go at creating my own hexie arrangement. I’m choosing fabrics for it now. …and my classes for QuiltCon 2018, too. Anyone else going? Are we in the same classes? And in case you think you only need fabric to create quilt patters, Sabrina Gschwandertner acquired a collection of old instructional films on the textile arts and has been creating quilt works of art. I will spare you the mumbo-jumbo about quilting from the LA Times, but here’s the article if you want to read it. I actually wanted to see the movies, after reading about her and seeing images of her work. Now it is lost forever. Will we feel that way about the millions of YouTube videos? I doubt it. There is something about the tangible presence of film being cut up, the scarcity of that resource being destroyed to begin again. But I do like looking at her works. If you are in LA, the article has info about how to see this in the gallery, but the show closes soon. And today is six months since my shoulder surgery. I’ve seen the surgeon for the last time, finished my formal PT. Now just the challenge of walking, getting back into some semblance of shape after sitting around, and doing the PT exercises on my own. LASTLY, thanks to all who entered the OPQuilt Summer Book Giveaway (snazzy title, don’t you think?). Amy Friend’s Intentional Piecing, a look at using fussy-cutting to make spectacular quilts. She has a range of stellar projects, plus some fun paper-piecing designs to sew into various quilts and hand-mades. It’s signed by the author. Again–leave a comment letting me know if you are interested in receiving this book in the giveaway. I’ll notify the winner by email. Update: Roxanne was our winner from the last giveaway. Thanks again for all who entered!